Imagining the Revolution is a series of short document-based lessons that challenge students to consider works of art depicting events of the American Revolution as primary sources — not for the events they depict, but for understanding how artists and their audiences have thought about those events. The goal of the series is to enrich understanding of the American Revolution and its important role in American culture, while teaching students to interpret visual images as historical evidence. The lessons in the series ask students to set aside the most common question asked about any work of art depicting an historical event: Is it accurate? They challenge students to ask more sophisticated questions: Why did the artist depict the event as he did? What does the work of art suggest the artist and his generation thought about the event and the people involved in it? 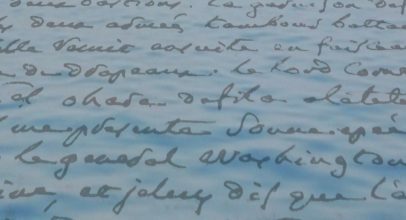 Imagining the Revolution leads students to consider visual arts in the same way we ask them to consider letters, speeches, and other documents. When students read Martin Luther King’s Letter from Birmingham Jail, their first question should not be whether King was right. Their first question should be about why King wrote what he wrote, and what he hoped to achieve. When they consider works of art as historical artifacts, students should ask what the artist was trying to convey and why. Each lesson in Imagining the Revolution is based on a work of art. Some present more than one, often inviting comparison between images and asking students to consider how and why the images differ. 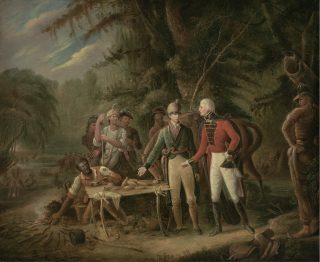 Some of the lessons focus on images created in the revolutionary era. 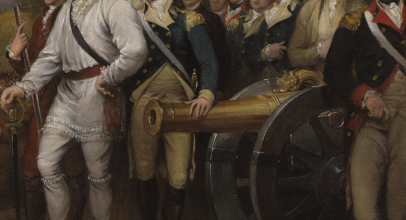 Others focus on images created long after the American Revolution, but which reflect the central importance of the American Revolution in American culture. A central premise of Imagining the Revolution is that the American Revolution created our national identity. That identity was shaped and defined by visual images of the Revolution. Some of those images, like John Trumbull’s depiction of the Battle of Bunker Hill and Emanuel Leutze’s Washington Crossing the Delaware, have been reproduced hundreds and even thousands of times, and are fundamental parts of our shared national culture. 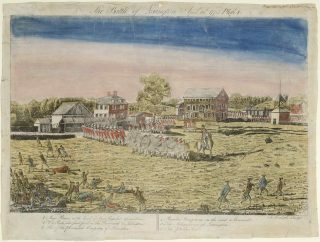 This first lesson introduces Imagining the Revolution and prompts students to consider how the first published image of the Battle of Lexington has shaped the way generations of Americans have viewed the first clash between patriots and British troops. 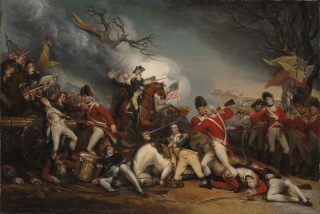 This lesson invites students to compare James Peale’s eyewitness depiction of the Battle of Princeton with John Trumbull’s complex masterpiece, The Death of General Mercer at the Battle of Princeton. 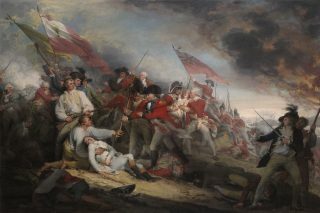 This lesson invites students to consider the meaning contemporary Americans attached to John Trumbull’s depiction of the first major battle of the Revolutionary War by comparing it to an imagine of the battle created within weeks of the event. This lesson invites students to consider how images of Francis Marion shaped the way Americans thought about the South Carolina revolutionary and how images of Marion reflect how Americans have thought about the Revolutionary War in the South.